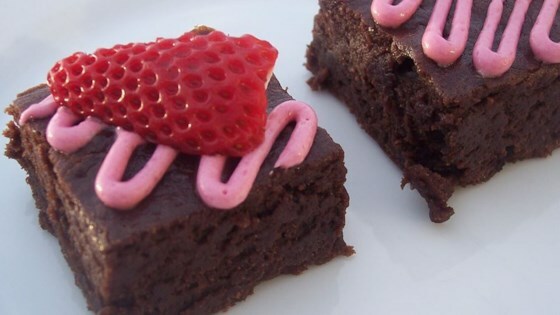 "These brownies are light and crumbly, with a punch of strawberry flavor. I made them one night with my boyfriend's daughter trying to teach her that there are no limits on what can be used when baking and cooking. I decided to use the fresh strawberries I had just purchased. I wouldn't suggest using frozen strawberries but if you do, defrost and drain well." Whisk together egg, melted butter, and vanilla in a large bowl. Puree about 1/4 cup of the sliced strawberries and whisk into the butter. Sift together the sugar, cocoa powder, and cake flour. Fold into the butter, and mix until well incorporated. Use more flour if needed to end up with a mixture in between a cake batter and a cookie dough (the strawberries will add additional moisture). Gently fold in the remaining sliced strawberries and pour the batter into prepared pie plate. I was looking for a recipe to use those strawberries that still have a little life but not much more -- these were interesting but not something I'd make again. These were pretty, smelled delicious and the flavor was great, but the texture was fudgelike and somewhat off-putting. I don't think I would make again.